Dairy cows are truly some of God's magnificent creatures. 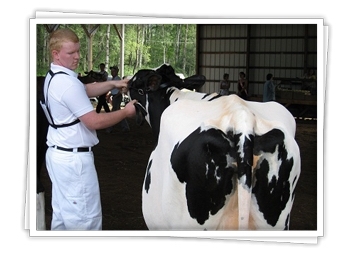 Though a mature Holstein cow averages 1500 pounds, the animals are generally quite docile and friendly. 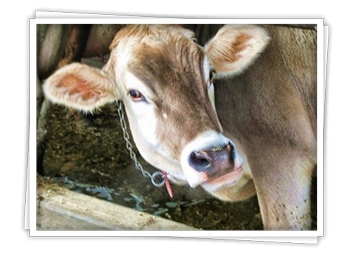 There are seven breeds of dairy cattle that come in every shape, size, and color. The herd at God's Country Creamery consists of Holsteins (black and white), Jerseys (brown), and Brown Swiss (gray). Just as no two cows have the exact same markings, every cow also has a unique temperament and personality (or maybe cow-ality). 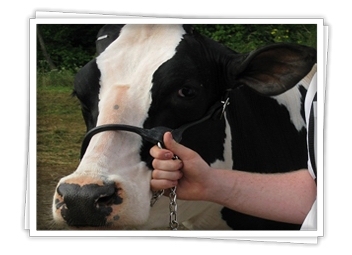 Here at God's Country Creamery we enjoy and celebrate each cow's uniqueness and invite you to get to know a few of the animals. Come visit us to meet the rest of the herd. It was a sad Easter morning for the Bachman family. Our beloved Shauna, a huge reason why we started making cheese, passed away during the night. Shauna would have turned 11 years old in just 10 days, nevertheless, she lived an exciting full life here on the farm. She will be missed by all. However, in darkness there is light, the same day that Shauna passed away, she had a great granddaughter born, Wellwyn High Shine. A little more about Shauna's life - Shauna was Hannah's 4-H project, and was the daughter of Saundra (Tribute to Saundra gives a little more background). 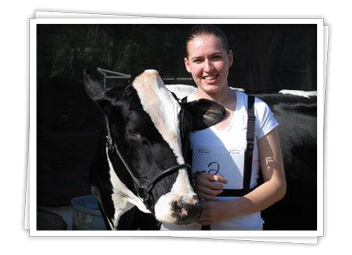 She grew up on Wellwyn Farm and only left the farm on road trips to dairy shows. She was quite the little show girl! Up until Shauna, the Bachman's were not milking cows at the farm. Yet, Shauna was a special lady and no one wanted to see her leave the farm - that is when the cheese operation began. Shauna had social anxiety when she was younger because no other animals were her age to be her friends, but she eventually realized she could be social with the rest of the cows. She gained her confidence showing at the county fairs and shows because she knew she was a champion in her heart, and the judges thought so too! Shauna adjusted to being the queen (boss) of the herd during her lifetime, and was loved by all humans that knew her. Her favorite time of year was spring and summer because she loved the fresh green grass on the hillside. She eventually had her own grazing lot that no other cow was allowed in, and fall of 2016, she spent grazing as long as the grass was green on the whole hillside behind the barn. No cow will ever be Shauna. Nonetheless, we know that she lived a full life, and we are truly blessed to have the chance to work with such a personal cow. She leaves behind numerous offspring to carry on the Shauna line; each having their own unique personalities that remind us of little glimpses of Shauna. Hello there! Even though I was been born in 2015, my spirit really lives in the 1960s - A Flower Child! I love to peace out, man and just relax. A lot of the other cows are all uptight and soooo competitive, I much prefer to just go with the flow. My friends really need to give peace a chance, they are all trying to be the "Top" cow. Come on man, Peace isn't the Destination, Peace is the Way. It is much more fun to be groovy, then grumpy! Besides, I can't take things too seriously because my nickname is Daffy Duck. My people friends like to call me that all the time, but I don't take offense, I just peace out man! I love to look on the peaceful side of everything and don't like to rush Radiate Positive Vibes :) I tell my friends all the time and I tell my fans, May every Sunrise hold more promise, and every Sunset hold more peace. Phew, it is hard work being the pretty girl around here! Oh greetings to you. You caught me after I have been getting my beauty sleep, someone has to do it around here, and I have nominated myself! It is obviously working tho since I go on road trips to different cow shows and I get to show myself off. I get all spruced up, I get a bath daily, a haircut & style, my toes trimmed and painted, and anything and everything I like to eat. Oh and I get attention all day and NIGHT too! I have to look good when I am being shown to promote the rest of my friends at the Bachman's farm. I don't like to focus on extreme high milk production because my time is best spent looking pretty and getting more beauty sleep, duh! (Yawn) Oh, it is nap time!!! This was me when I was younger, however my show days are probably over because of my aging feet and legs, nevertheless I am enjoying just being a cow. I am focusing more on producing more milk, and I look forward to seeing if my babies will continue the show run like I did in my younger years. I am very friendly, and you can still find me napping and I am probably dreaming about doing my catwalk about the ring! Oh Hi! I am Jenga. My grandmother is Janet, and my mother was Jingles, she was born around Christmas time, hence her name. I come from a pageant family, and pretty-girl-genes run through my blood. What also runs through my blood is stress anxiety!! My whole family has it, and some are worse than others. Hence where my name came from, if you have ever played the game Jenga, you will understand! Most of the time, I can hold my stress anxiety in check, and the Bachman's are great at helping me deal with the stress. However, hmmm sometimes, I just can't take it anymore, and I have a little breakdown. The breakdowns are a family trait, but with my humans knowing more what makes the breakdowns happen, the more I am rising above the anxiety :) Most days, no one will notice anything different about me verses the rest of my friends, however when showtime comes around, I start getting very nervous. But thanks to Hannah's help this year at the fair, no breakdowns! Yes sireee, I made it all show season with no breakdowns! Daffy has helped me try to focus on mediating and breathing through the stress of everything, and I would say it is really working! Howdy ho, there. I'm so glad you are getting to know us cows. Oh, I hope you get a chance to come visit us here at the creamery. I LOVE meeting new people. I really do! No matter what time of day visitors come, I always come over to the feed bunk to meet them. Nap time? No problem, just give me a second to push the sleepy from my eyes and I'll be right over. Meal time? No problem, food can always wait. When I was younger, the Bachmans called me Love Bug because of how friendly I am. Whenever they'd come in my pen, I'd run right over to love on them and get petted. 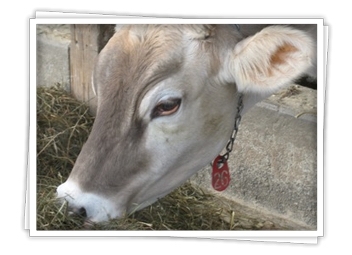 Well, as the only Brown Swiss representative here on Meet the Cows, I should tell you a little about our wonderful charm. 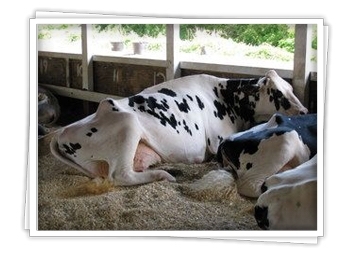 We are one of the most docile of all the dairy breeds. Generally, we are really laid back and enjoy going with the flow. However, we really like consistency. Don't go changing things up suddenly on us. Whoa! Don't frustrate the Swiss! Saundra was queen of the herd here at God's Country Creamery. Though at eight years old, she was, more than twice the age of any of the other cows, don't think this granny, was ready to retire to the back forty. She still produced over 100 pounds of milk every day (that is about 12 gallons of milk per day or 200 glasses) and walked over a mile each day grazing on the hills here at the farm. When the milking parlor doors open, she could out run any cow in the herd to be first in the parlor. There was hardly a gate or door on the farm that she couldn't figure out how to open. In fact she passed on her Houdini skills to both her daughters: Shauna and Sugar. Nobody pushed one over on this granny. Though she was most at home on the farm, she was no stranger to the show ring and you might say she was some what of a beauty queen in her day. When she was just a baby calf, she participated in the 4-H lease program. The program allows kids without cows the opportunity to lease a cow for a 4-H project and show her at various dairy exhibitions around the state. She was chosen to be leased to a girl named Sarah. She very much enjoyed working with Sarah and then was returned to her owner, Rachel Bachman, at the end of the show season. With Rachel, she experienced the height of her showing career being named Grand Champion of various shows. Now owned by the youngest Bachman, Hannah, she is mostly retired from the show ring. However, she did attend the county fair this July and was delighted to watch her daughter, Shauna, follow in her footsteps and win Grand Champion. Being born in 2000, she was one of the last calves born on the farm before the Bachmans sold the majority of the herd. Because she came from a very strong cow family, she was one of those chosen to remain in the herd and was the only cow at God's Country Creamery from that original herd. She was also a member of the small dairy operation run by the three kids. After the kids stopped milking at the farm, she went to live at a dairy operation in western Pennsylvania. Though she was treated well there, she seemed so happy the day a truck pulled up to take her back home to the Bachmans. Unfortunately, Saundra became ill and was laid to rest there on the farm in the fall of 2008. The Bachmans were all very sad to see her go; her presence is sorely missed. She added so much spark to chore time and touched so many hearts. Though she is gone, she continues to live on through her daughters and in the Bachmans' memories. One of the hardest things here at the creamery is saying good-bye to the lovely ladies when they pass away. Sadly, this year we bid farewell to a very special one. Every one at the creamery will miss her. She was Phil's 4-H animal and the mother of many of the other animals he exhibited in recent years. Janet came to live here at Wellwyn Farm when she was just one month old. Phil and Hannah bought her at the Allegheny-Steuben sale in 2005 and to this day we fondly remember that purchase as the best $850 we ever spent. Janet comes from a very good family with 10 Very Good or Excellent grandmothers. In 2007, Janet made her show ring debut as a Fall Yearling. She was awarded Junior Champion Holstein of the Potter County Open show. Following in her footsteps, her daughters went on to win this award for the next four consecutive years. That year she also "helped" Phil win the senior Master Showman designation. She was always a bit...uh...spunky in the show ring. Janet was not a huge fan of all the attention of the show ring and was most at home on the farm. In her lifetime, Janet produced 94,182 pounds of milk. That is almost 11,000 gallons! She also gave us four beautiful daughters: Wellwyn Best Jazz (EX 92), Wellwyn Pronto Josie (EX 90), Wellwyn Dundee Jingles (VG 87), and Wellwyn Dundee Jamaica. Her granddaughter Wellwyn Lightning Jive (GP 82) is also now part of the milking herd. We are very blessed to have called Janet part of the herd for the past seven years.